Describe Cards - Perspective Exploration | Games and activities for therapists, families, teachers, and more! 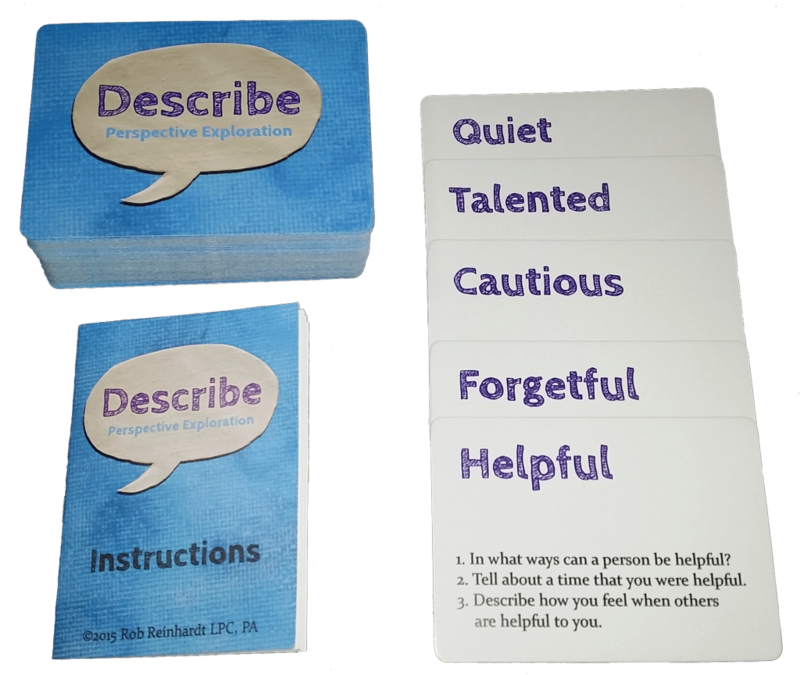 Describe is a deck of cards that serves as a game, an ice breaker, a conversation starter, and a path to greater understanding of ourselves and others. And now it's available WORLDWIDE! Put down those phones, communicate, and have fun! Deck Two now available! Buy Deck One and Deck Two together and save 10% on both! Activity Board now available for Pre-Order! Instructions for over 24 activities & games for individuals, couples, families, and groups of ALL AGES. Great for therapists, counselors, families, teachers, coaches, RPG players and more! Deck One features 104 Describe Cards on high quality stock. Deck Two adds 56 cards and a collector's box! Unleash your creativity with the Activity Board. 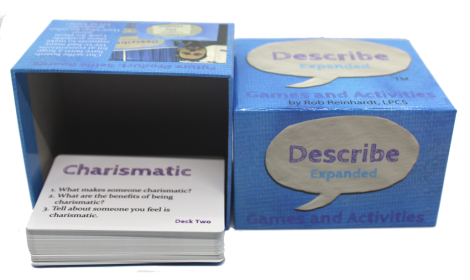 The Describe – Expanded campaign made it possible for the creation of Deck Two AND makes Describe (Both Decks) available in other countries for the first time. To make sure you receive updates, subscribe to our newsletter below! Purchase them both together and save 10% off on each! 10% off!! Buy both Deck One and Deck Two and get 10% off of each! Join to receive your discount code and access to all games and activities! What Are Users of Describe Saying? These are awesome. You've got to get these! I have bought a few decks to give to other counselors as gifts. You will not be disappointed! This deck was created with therapists and counselors in mind; however, it's appropriate for a much wider audience. There are great instructions on heaps of activities on the Describe website. I highly recommend that you buy these cards, they’re a tonne of fun for everyone. Describe comes with instructions for over a dozen activities and you can find even more in the regularly updated instructions on this web site. The video below demonstrates five of the possible activities. Have you found new and interesting ways to use Describe? Contact us to let us know! An amazing array of individuals and groups have found Describe to be engaging, and useful in their work and play. Therapists and Coaches use Describe as an ice breaker, assessment tool, and in helping clients explore perspectives and feelings on various aspects, relationships, and challenges in their lives. Describe is great for individual, relationship, and group work for clients age 8-108! Teachers use Describe to explain adjectives and explore the sometimes varied and nuanced meanings of the words. Exploring the words and questions may also help expand student vocabulary and emotional intelligence. Families use Describe to prompt important conversations that increase understanding of one another. They can also have a lot of fun with the games! 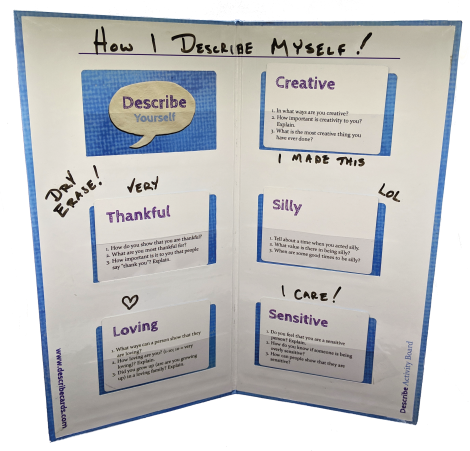 Describe has also been used by authors and role-playing gamers to explore character development and motivation; creatives and problem solvers as a lateral thinking tool; team/group leaders as a team building tool; the list is limitless! What will you learn about people while using Describe? Get Deck One! or Get Deck Two!